"I am Pipeline" is a collection of photographs taken in February 2016, during what many called 'The greatest Pipeline ever'. Arguably too, the Winter season of 2015/2016 will be recalled fondly as one of the most epic surf seasons in Hawaiian history. The North Shore of Oahu is one of the most spiritual places for surfing in existence. The Banzai Pipeline is magnificent in its power, but still incredibly destructive and some of the most skilled surfers have met their fate here. It can allow the most awesome rides. But it can even more easily destroy. I was privileged to watch probably the highest level of surfing I had ever seen at Pipeline and Backdoor those days. I remember one of the most incredible sights as the hooter rang closing out the Volcom Pipe Pro. The sets were 8-12 feet all day and several surfers raced out to the lineup to get their share having watched Kelly Slater, Makai Mcnamara, Bruce Irons and Jamie O'Brien destroy perfect Pipeline in the final. A rogue set approached the lineup, it was easily 15 feet. A lone figure paddled hard onto the wave from second reef. Whoever he was, he just knew. He knew the wave. I have never witnessed a wave more perfectly ridden than this one. It had been too big for Backdoor. 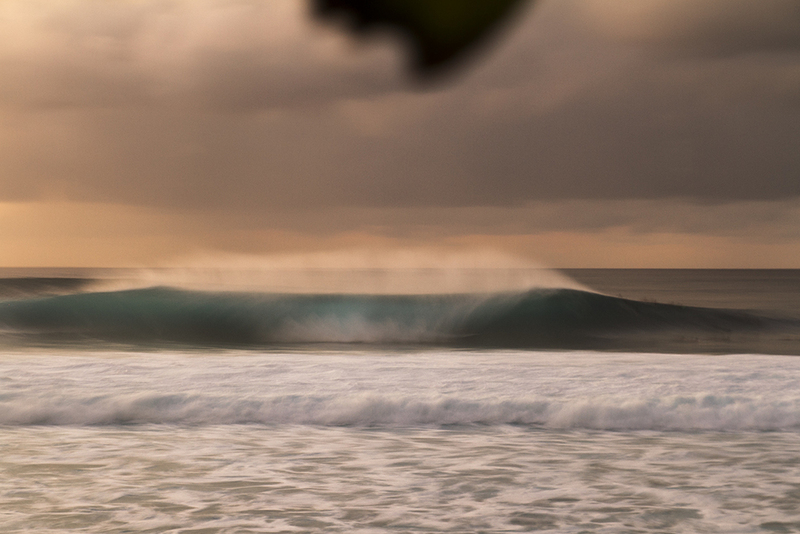 By this stage, barely anybody had been seeking out Backdoor rights as the terrifying fate of being caught inside with feathering third reef and thundering second reef sets charging towards Pipeline from behind, it seemed certain destruction to go right. This lone figure started driving his bottom turn, before racing up and high-lining over the top of Backdoor. To see a man high-line 15ft Backdoor was itself truly phenomenal. He proceeded to race high above the mountainous wall which closed out over Backdoor and Off The Wall lefts before dropping to the bottom of the wave and pulling into a cavernous Off the Wall right. By this stage of the wave, the surfer had traveled so far down the stretch of beach that it was impossible to see if he had survived the barrel. But of course, as I said, he simply knew. In the glowing distance of the sunset, a figure kicked out skywards before paddling with controlled desperation towards the horizon. He knew how to surf. I have no photograph of that moment. Only my eyes saw it. And It was perfect.